Do you want to know how to make coconut milk? If you regularly use coconut milk in your cooking, learning how to make coconut milk will save you a considerable amount of money. That’s because it’s hard to find coconut milk that’s not only organic, but also free of guar gum and other additives, and packaged in BPA-free containers. By making coconut milk at home, you can meet all this criteria and save money. What’s not to love? I can buy organic, guar gum free, BPA-free coconut milk for about $2.75 per 14oz container, or $1.57 per cup. I can buy organic, unsweetened coconut chips for about $17.50 per 3 pounds. That makes 48 cups of coconut milk, so it comes to $0.36 per cup! That’s a huge savings simply for learning how to make coconut milk at home. Inspired by this video recipe from Radiant Life. Makes about 2 cups. 1. Heat water on the stove until it’s hot, but not boiling. 2. Put coconut chips in blender (I recommend and use this one.) Pour hot water over the chips. 3. 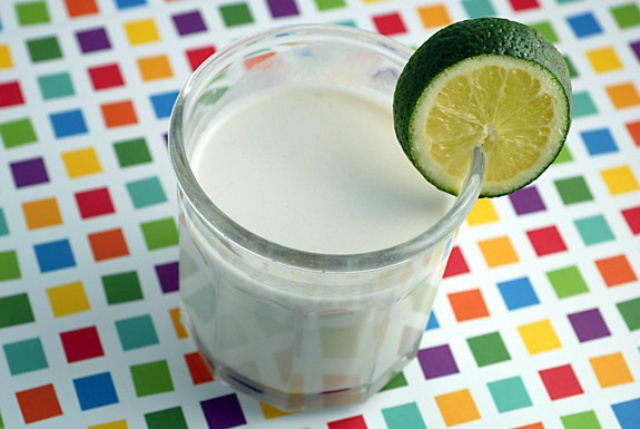 Blend on high for 2 minutes, or until you get a creamy, thick homemade coconut milk. 4. Line a strainer or colander with cheesecloth. Pour the coconut milk through the lined strainer into a bowl. This will remove any larger remaining coconut meat. When you’re done pouring the coconut milk through the strainer, ball up the cheesecloth and give it a good squeeze to press the remaining liquid through. You can use your residual coconut caught in the cheesecloth in a recipe that calls for coconut, or you can toss it. 5. Transfer your homemade coconut milk from the bowl into a mason jar or other container. Use the homemade coconut milk immediately, or keep in the refrigerator for up to four days. When you make coconut milk this way, it’s delightfully fresh, creamy, thick, and full-bodied. You won’t go back to store-bought milk again! 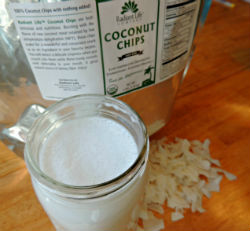 I get the organic coconut chips I use to make coconut milk from one of my sponsors, Radiant Life. Their coconut chips are sustainably harvested, organic, and low-temperature dehydrated to preserve nutrients. They’re also completely additive-free with no hidden sweeteners or preservatives. I buy the Nutiva coconut manna (have also used Artisana) to make coconut milk. 1 part coconut manna (also called butter) + 2 parts water in the blender. Works great! How do you make coconut cream? How do you make coconut milk with fresh coconut? It’s pretty much the same, but you would use one brown coconut per 2 cups of hot/warm water. You just have to add in the added step of cutting the coconut open and removing all the meat. I did that once and decided it was too much effort for this busy momma! It turned what normally takes me 5 minutes from start to finish into a project that took 25 minutes. I noticed that Radiant Life offers larger chips or smaller flakes. You mention both in your recipe. Which have you had the best outcome with? Have you made ice cream with the coconut milk? I have the best outcome with coconut chips. Sorry if my language was confusing! I went back and edited it so that it’s clear I’m referring to chips the whole time. And finally, yes you can use this coconut milk just like you’d use any other (including for making ice cream). I don’t buy dried coconut chips. I buy coconut. I think my coconut milk / kefir / flower are cheaper. And it’s easy to crack the nut open. Likely so. 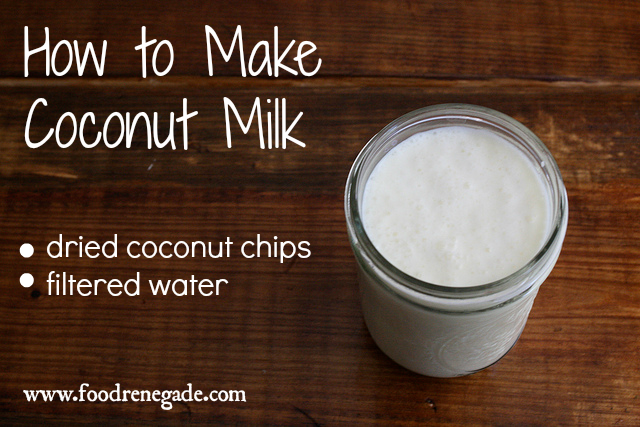 I’ve made coconut milk from brown coconuts before, but found the process too time consuming for me as a busy momma. It takes an extra 20 minutes or so to crack the nut open and remove the meat — turning something that’s a relatively instant process into something that requires actual planning and TIME. One of the ways I manage to feed my family real food is by taking my breaks where I can get them. In this case, I source coconut chips from a reliable source and radically reduce both my costs and my time spent in the kitchen. Also, I can’t find brown coconuts for less than Radiant Life’s Coconut Chips where I live. I can when I’m in Houston, visiting family, and go to their large Asian markets. But here in small town Texas, outside of Austin, brown coconuts cost about $1.50 each. Each one only yields about 2 cups of coconut milk, so that’s $0.75 per cup (twice what I pay by using coconut chips). Anyhow, if you have access to cheap fresh coconuts and the inclination to crack them open and remove the meat and process it into coconut milk & flour, more power to you! I’m just glad to have found a solution that’s pretty accessible to everybody — regardless of where they live or how little time they have. Is there anyway to turn the leftover coconut into coconut flour? At the rate we go through the milk, we would end up throwing out a LOT of flakes. But if it could be turned into flour – that would be a wonderful benefit!! Yes, just dehydrate it. If you want it to have an even texture, you can pulse the dehydrated leftovers a few times in a food processor. Just be careful because if you pulse it too long, you’ll turn it into coconut butter. YES! I just did this yesterday! You spread the leftover coconut on a baking sheet (or place it in your dehydrator) and set your oven at the lowest temp (mine is 150) and dry anywhere from 2-12 hours until completely dry. Mine only took 3 hours and I stirred it around once. Then you take the dried coconut and place it in a coffee/seed grinder (in batches) and whiz it around for about 30 seconds. Voila! Coconut Flour! Hello, does your coconut flour bake like commercial ones do? I’m having trouble with that. When the coconut cream rises to the top and hardens in the refrigerator, it makes it kinda chunky to drink and my kids hate it… Any suggestions? I don’t want to let it out to soften because I’m afraid that hastens spoiling and we like it cold. Also I’m not real fond of removing the hard cream because isn’t that where all the good medium chain fats are? Thanks! No. Maybe another reader? We always use our coconut milk in recipes and don’t drink it. We let the oil/cream rise to the top and then I remove it and put it in a jar in the fridge. Then whenever a recipe calls for oil, I use this. Sometimes I just munch on it. It’s mostly oil from what I have experienced. Has anyone done a cost comparison? I assume you save making your own coconut milk. I am so glad step #1 wasn’t “Go buy yourself a coconut.” I’ve tried that, and after some dinged up kitchen utensils and bowls, most of the coconut was buried in the back yard. Ha ha! Right? It’s kinda like opening up fresh oysters. You need the right tool and a lot of practice. Otherwise, it’s a lot of work. What’s wrong with guar gum? Maybe nothing. It’s been shown to cause digestive distress in people who already have digestive issues (1 in 3 Americans, according to the latest surveys). It doesn’t personally affect me, but I think it gives my middle child stomach aches. Hi Kristen, Thanks for the recipe for coconut milk. Another concern I have is that coconut milk is high in fat. Do you know anything about this or how one could reduce the fat content? I actually like that coconut is high in fat! What is the difference between using coconut chips vs. coconut flakes? You can use either, but the quantities may need to be adjusted a little. I’ve also found that the milk made using the chips comes out creamier. Maybe because they’re thicker when dehydrated, they have more fat? Can you just use regular shredded coconut from the health food store? Yes, you can. 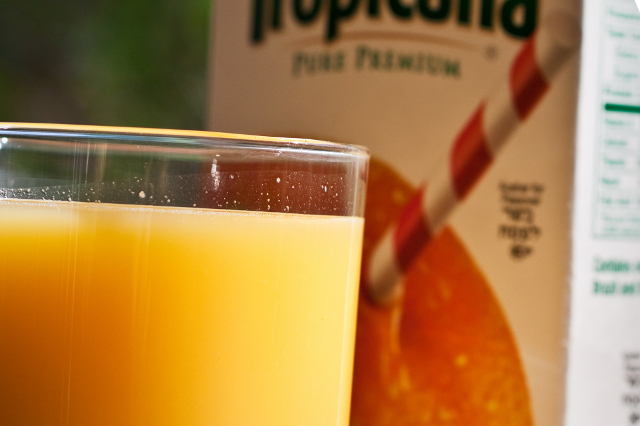 Just make sure it’s unsweetened, low-temperature dehydrated, and has no fillers or additives. Also, I’ve had better consistency with the chips, which is why the recipe recommends them instead of shredded coconut. Could you freeze the milk to extend shelf life? I am not sure that it would be used within four days. You could try it and find out. It’s pretty much the perfect amount for a few days’ worth of coffee creamer, the perfect amount to add to curries or soups or stews. It’s meant to be made and consumed quickly. Is it possible to make this in anything other then a vitamix? We do have a smoothie maker with a sharp blade, would that work? also, you mentioned low-temp dried coconut….do you know how low that should be? My supplier says the coconut is dried anywhere between 190-270F. Absolutely any blender will do. If it *had* to be the Vitamix, I would have named the brand and listed it as necessary equipment for the recipe. Low-temperature at or below 118F. It keeps the coconut technically “raw,” preserving the enzymes and other heat-sensitive nutrients. I may go buy some cheesecloth and try this! One question, what does one do with a used cheesecloth? Toss in into the laundry? You could also use a thin, clean cloth diaper. (The old-fashioned kind that you have to fold many times.) They sell those at Wal-Mart and Target, so they may be easier to come by. And yes, you can generally toss it into the laundry and treat it gently (like you would pantyhose or other delicates). I just tried to purchase the 3 lb bag of coconut chips for $17.50. The shipping cost was $76.11. That kinda kills the 36 cents a cup goal here doesn’t it? Where are you trying to ship to? Standard shipping everywhere in the contiguous 48 states is usually $8 or less. Plus, I always place bulk orders, so I get free shipping from them. shipping to CO, that’s it. I even emptied out my cart a coupla times and same thing. Try clearing your temporary cached files. I don’t know how to do it on a Mac, but on a PC you just hold down ctrl and F5 at the same time on the page you want to reload. So, I’d empty your cart of EVERYTHING, then try clearing the cache, then go shopping again and add the items you want back into your cart. Next, make sure you select standard UPS Ground Shipping and input your address correctly. If you still have the same issue, I’d contact Radiant Life’s customer support and see if they can help you. All I know is that the price you were quoted makes no sense at all. Just tried again and same thing. $76.11 shipping. Someone else please try it and see what you get. There’s no commitment up to the part shipping is calculated. OK never mind it was my fault. Somehow the shipping changed to next day air. I know the first time I did it it was normal ground. I did have to do it a time or two cuz I mis-typed something so it must have changed in there somewhere and I stopped paying attention. seems “wasteful” to buy such good quality raw coconut, and then put it in hot water, basically nullifying the raw enzymes. It sounds soo good though, will be trying it raw or not! It will still work with just warm water, particularly in the Vitamix. So, if you’ve got a powerful enough blender, you can keep it raw! So I tried this the other day and ended with coconut flavored water. Hardly the creamy loveliness that comes out of a can. I purchased the coconut flakes you use and even used more than one cup. Although one cup is kind of up to the individual. One could use a cup of loose chips of pack them down hard. I used a loose cup and then grabbed another handful or two. How exactly do you do it? Even more importantly, does yours turn out thick and creamy like the stuff that comes out of a can? OK so no love for the QDog? C’mon y’all, I need someone to help me figure this out. I love a dalop of creamy coconut milk in my morning coffe along with a touch of chocolate. Real milk separates. It’s what you call an unstable emulsion. Same thing with coconut milk without additives, probably. I imagine after you’ve drained and chilled it, you could remove the water and use only as much you’d like as you blend it again. Am enjoying your site! Do you have a recipe for coconut flour? If you’re not making coconut powder, what do you do with all the leftover pulp? Seems like a waste to throw it out. I don’t have a food processor. Just a blender. What do you think of the concentrated coconut cream you can get in the mylar packs, now? Is this for drinking, like the type bought in the carton or for cooking, like the type in the can? Melody — I use it for both. Its consistency comes out kinda in between the two. Thanks for letting us know where to purchase the items we need for the recipes. Real important for all us. Thanks. Will this work just as well with shredded coconut instead of coconut chips? I have tried this recipe twice using two different blenders. It never produces a thick and creamy milk. I REALLY want to stop using canned coconut milk. Any tips? Thank you so much. Hello…I have tried this twice now with different blenders and I don’t get a thick and creamy consistency. It is watery. Do you have any tips? I really want to get away from canned coconut milk due to the bpa. Btw…I am someone who got very ill from repeated consumption of a guar gum product. It started as a digestive problem which led to ulcers and then impacted every major system in my body. According to my homeopath guar gum has a variable ph and isn’t fit for human consumption. I mention ths because another poster asked about it. Anyway, I avoid it at all costs!!! This turned out great, thank you for the recipe. Just a question (seriously, no one I’ve seen online addresses this, and I’m dying to know): how on earth do so many “paleo” people justify eating meat, which is undeniably the absolute worst and most selfish feature of our SAD in terms of environmental impact? How does being “grass-fed” make it better (ecologically, it’s way worse)? I’m bewildered by the phenomenon of people supposedly concerned with the natural environment and our planet who are insistent that creating/housing/raising/slaughtering grass-fed animals is in line with their beliefs. So selfish. Nice recipe, but does the heat of the water destroy any nutrients of the coconout flour? What about canned coconut milk from the health food store? If its a BPA free, wouldn’t that work? I couldn’t get So Delicious Coconut Milk, had to read the labels on so many as many contain Soy which is not healthy, brought home a Silk Almond/Coconut blend & it is gross tasting.